Yahoo updates Mail and Messenger for Android | Android Blast! 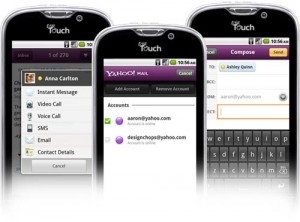 Yahoo has updated their Mail and Messenger apps for Android and things are looking good. The big news is the addition of video chat from Yahoo Messenger. Currently video chat works in a limited capacity but it's still big news. You'll need Android 2.2 to enjoy this new feature. Another notable feature is that both apps now integrate well with the Android address book. Check the QR codes below for the download.